The seeds of this remarkable relationship were actually sown by a young Navy dentist moonlighting at a practice in Virginia Beach in 1977. His name was Dr. Malcolm Mallery, a graduate of The Columbia University College of Dental Medicine. Dr. Mallery would take lab owner Buddy Shafer under his wing and be a constant mentor over the next thirty plus years. Back then, it was the other yellow book, (referring to the golden yellow color of Dr. Dawson’s first book) that Dr. Mallery would quote and reference on a daily basis. Dr. Mallery helped Bay View form a Dawson study club that would bring even more exceptional dentists together. Two in particular, Dr. Jim Pauley and Dr. James Baker encouraged Buddy to join them in attending one of Dr. Dawson’s hotel courses in Florida. Buddy agreed and the rest, as they say, is history. 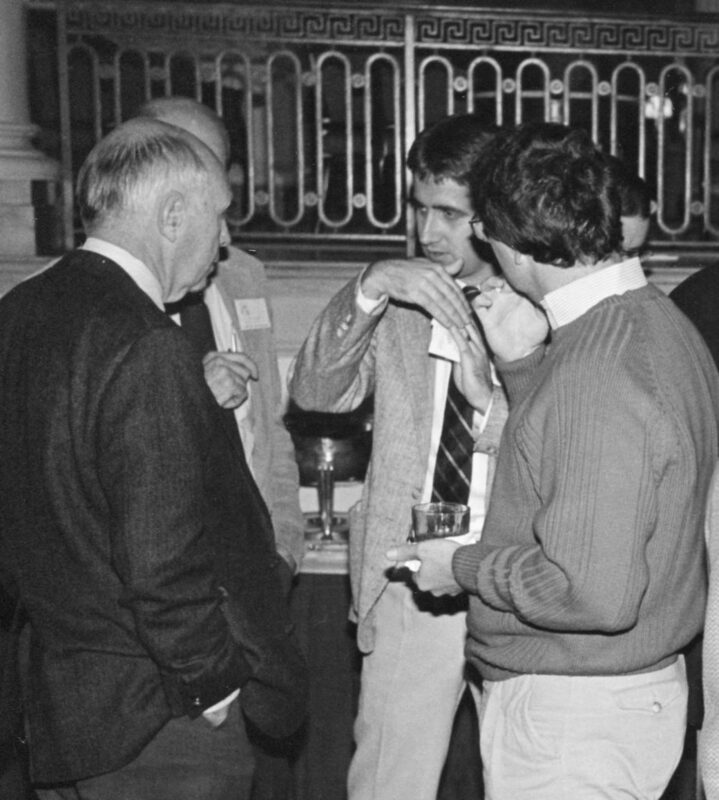 Dr. Dawson with Buddy at an early study club. Buddy and Dr. Dawson had an almost instant connection. 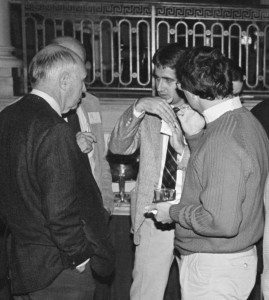 The relationship was the beginning of what would turn into a lifetime friendship between the Dawson and Shafer families.Buddy and his brother Rick, along with virtually every technician in the lab over the next thirty five years, would attend all of Dr. Dawson’s courses. The concepts made sense and would be passionately applied to all phases of Bay View’s work, just as Dr. Dawson encouraged his doctor students to do. 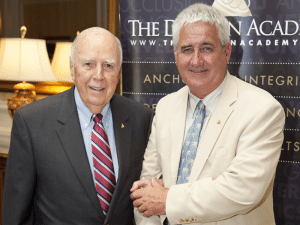 Throughout the 80’s and 90’s, Dr. Dawson made trips to Virginia to host classes in support of the now substantial following Bay View had established in the Mid-Atlantic area. The Virginia based Dawson study club was one of the most recognized in the country, hosting some of the biggest names in dentistry – Mark Piper, Parker Mahan, Alvin Fallistre, Pete Roach, Bill Strupp, John McLean, Terry Tanaka, Jack Turbyfill, Glenn DuPont, Ron Kobernick, Henry Gremillion, Frank Spear and many more. The Dawson Center was thriving as well, and with the decision to add a technician’s track to the curriculum, Buddy Shafer was a natural choice to join the faculty and create the series of programs which continue today. Dr. Dawson with Buddy, 2010. In 2008, Bay View was involved in the creation of The Dawson Academy Accredited Laboratory Association, a process to identify the most qualified full service dental labs in the country. Bay View was one of just three labs in the country to qualify. 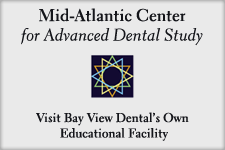 In late 2009, Dr. Dawson paid a return visit to the newly expanded and remodeled 13,000 square foot facility in Virginia, now hosting Bay View Dental Lab and The Mid-Atlantic Center for Advanced Dental Study. The entire facility has been created with one vision in mind; to facilitate Dr. Dawson’s philosophy and teachings of complete and comprehensive dentistry. We at Bay View are proud to be a part of this great legacy in dentistry.